Having second thoughts about not getting the Digital Extreme edition of Europa Universalis IV from the start? Here is your chance to upgrade your game. The Star and Crescent event pack enhances the gameplay for rulers of the Muslim faith in Europa Universalis IV. A total of 70 new event pictures contained in this package adds enhanced visuals to the gameplay experience. This event pack also contains several new events and event chains for Muslim rulers, adding to the gameplay immersion. Preferring speed and mobility over heavy armor, the cavalry of the Muslim world have been the pinnacle of warfare for centuries. 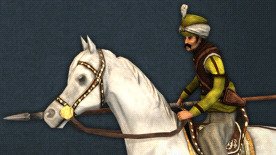 With a total of 12 unique cavalry models, for the Ottoman, Mamluk and Persian nations, the Horsemen of the Crescent Unit Pack enhances the visual experience of Europa Universalis IV. Inspired by the Siege of Constantinople, the Conquest of Constantinople Music Pack adds three new songs to the Europa Universalis IV soundtrack. The three new tracks, containing 10 new minutes of masterfully composed music, were created by the talented Andreas Waldetoft, famous for the music of previous Paradox games such as Crusader Kings II, Hearts of Iron III and Victoria II.